Are you one of us? Read on. You might be. Digitally-enabled people, on the move, creating a global village. Technomadic is a word we use to describe the way we are beginning to think and behave as a species. Nearly two billion people are already living a lifestyle affected by the internet. Some are traveling first class in fancy suits to their next board meeting, trying hard to pull themselves away from their constantly-bombarded smartphone. Some have fully equipped RV’s, and bounce around from place to place at leisure, while maintaining an optimal work schedule online. Some keep it simple with a thumb, a backpack, and a laptop. Others of us are more stationary technomads, living in suburbia with a lightening-fast fiber optic internet connection. Some are still dialing up at internet cafes, or connecting via packet radio from a faraway island. No matter how you get here, connecting via the internet puts you in touch with your human family. Your social circle is no longer limited to your family, co-workers, and neighbors. The internet allows us to become more aware of the breath in others on the opposite side of the world, in cultures completely foreign to us. To read about the Technomads behind this website, click here. A History of the Technomad? 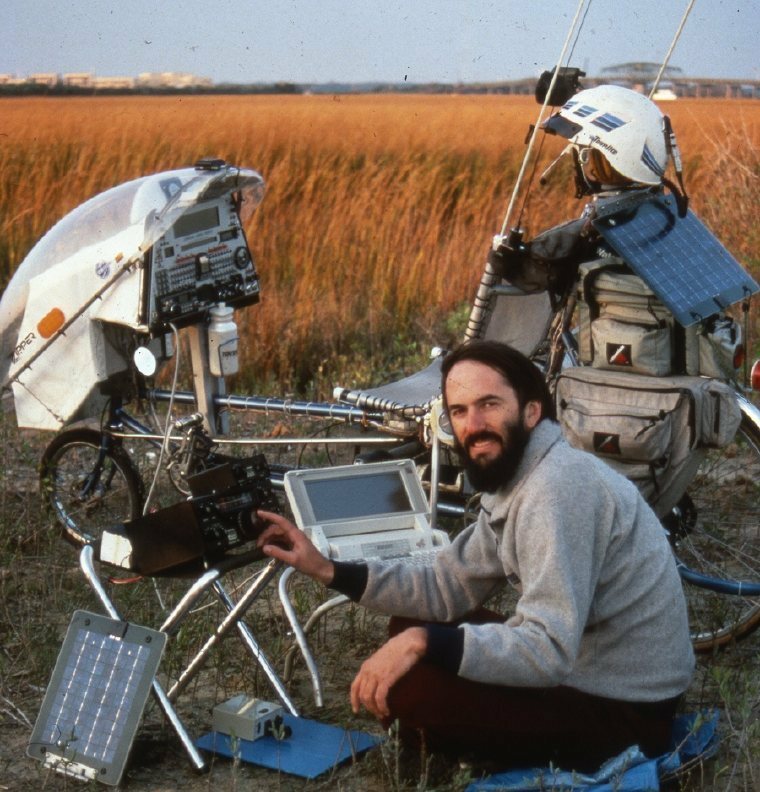 As best we can tell the word “technomad” originated in the 1980s with Steven K. Roberts who set off on a 10,000-mile journey across the U.S. with a wired and solar-powered recumbent bicycle. Since that time, humanity has become freer to continue fostering relationships and working on projects without the requirement of geographical proximity. As the word and the lifestyle have gained recognition, several interchangeable terms have surfaced and stayed, such as digitally-enabled nomad, neo nomad, and location independent professional. Other technomad online communities and resources. Our vision is to propagate useful positivity and action steps to catalyze meaningful change. We want to inspire you to chase your dreams. We’ve created Teknomadics as a network and info hub for socially and environmentally conscious adventurers from around the world. In these pages you will find resources and stories about living sustainably, traveling responsibly, and contributing to a world more in tune with nature and the cosmos. Learn more about the people behind Teknomadics. What an inspiring website! Thanks for setting this up fantastic resource. I am looking forward to following your adventures and hopefully our explorations will lead us to meet again one of these days. Hey guys, I’ve been living in a van with my nomad-brother Cory since November of this past year travelling around the U.S. I just found a business card for this site in a coffee shop bathroom somewhere near San Diego CA, and I’m so glad I plucked it off the wall. I love your mission, I love your hearts, I love your motivation… I grew up in a very religious family and was taught that humility, simplicity, and compassion are most important in one’s spirit. I have since changed my religious views slightly, but I haven’t lost the lessons I learned from them. I went to a university last year in hopes of entering the Peace Corps. as a teacher (it made me smile reading about Meghan), but I couldn’t understand why I had to put my family in debt while trying not to lose faith in myself because of the seemingly useless education I was getting just to pursue a life of nothing but love. I had been to Honduras on a mission trip the previous year and had found more truth and more of an education in the two weeks I had there. So I hit the road after saving money for the summer on a mission to find my path to that life of love. I haven’t found my heading yet, but I haven’t lost hope. If you have any suggestions, I would be absolutely delighted. Again, you are beautiful and I’m sending the best of vibes your way! Thanks so much for the comment Annie, this is why we do this, it warms our hearts! I am originally from San Diego and had posted some cards up for a writing contest we were having. We both quit our jobs a couple of years ago, and were on a similar mission, traveling around California and Mexico after Burningman in 2009. We had a lot of amazing experiences, and met wonderful souls – not worrying too much about the future, as everything needed was always somehow provided. I can only speak from personal experience, but my advice is to keep at it, live in the moment, know that everything happens for a reason, and listen to the universe because it will lead you to your path. Be grateful for what you have now, be present to the abundance already in your life. Simply Be Love and everything will unfold! After about a year of wandering and wondering about our paths, we were called to Yosemite, and then to Thailand. You will be called too. Love and light your way! Keep in touch, would love to hear how you and your brother are doing.